My eldest daughter loves cheddar cheese and lumpia. Combine them together and she’s one happy child. One day, I was trying to figure out what to do with half a block of sharp cheddar cheese that’s been sitting in the fridge for a couple of days. 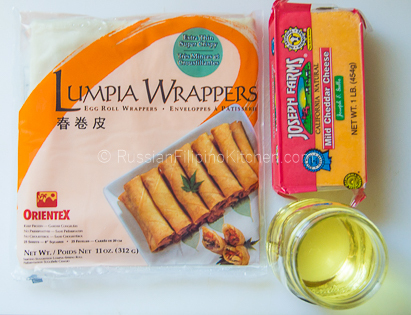 I had extra sheets of lumpia wrapper in the freezer so I wanted to make cheese lumpia to surprise my little one when she comes home from school. Having no prior experience with making cheese lumpia, I ruined the first batch. The rolls were floating in hot oil with all the good cheese oozing out into the surface! Good thing I only made like 10 pieces. Then I realized I had to freeze the cheese first so it doesn’t melt too fast. 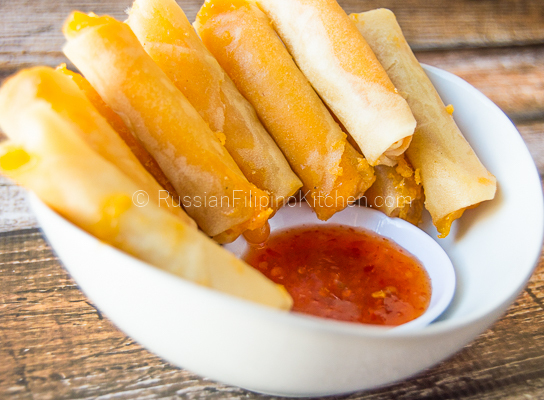 Since that day, these crispy cheese lumpia rolls have become a family favorite. To those unfamiliar, lumpia is the Filipino term for spring rolls. It’s a very versatile dish that can be filled with anything–meat, seafood, veggies, combination of all three, fruits, jams, even cheese. They are great as appetizers, side dish, and snacks. 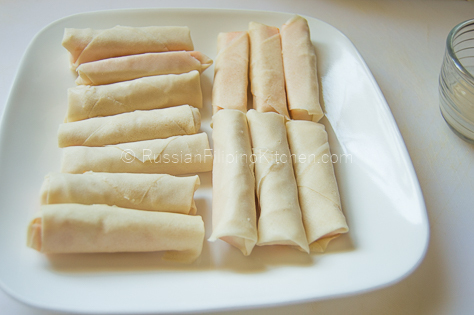 It’s good to know that any lumpia variation (except the fresh lumpia as far as I know) can be prepared ahead of time, frozen, and fried few minutes before serving. This makes it easier to make a huge batch, store in the freezer, and cook only when needed. 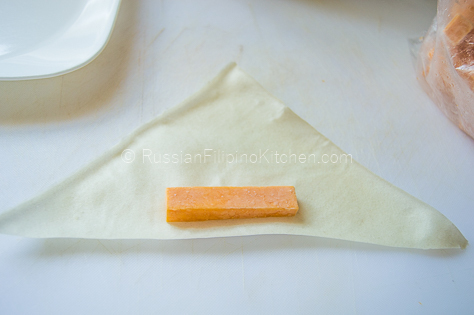 This cheese lumpia recipe I am going to share with you requires only 3 ingredients: cheddar cheese, lumpia wrapper, and vegetable oil for frying. Sounds very easy. And it is, actually. 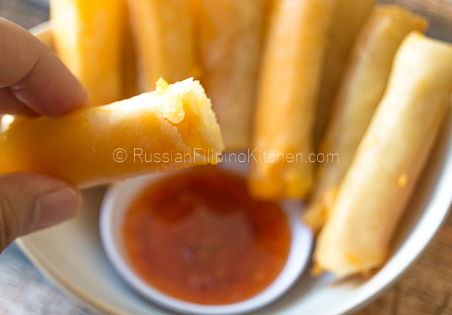 However, there is one thing you need to be aware of: you can’t just roll slices of cheese into a lumpia wrapper and fry the rolls directly in hot oil. 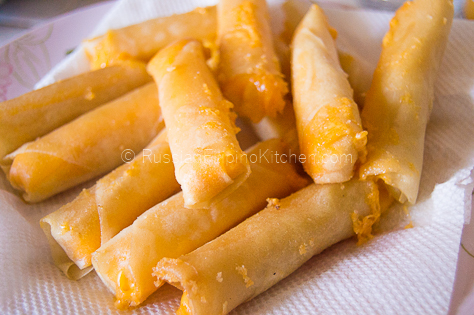 You’ll end up with a hollow lumpia as the cheese melts quickly upon contact with heat. They’ll leak out of the wrapper and into the oil leaving you with nothing but an empty lumpia roll (my first time experience)! The secret is to freeze the cheese before wrapping. 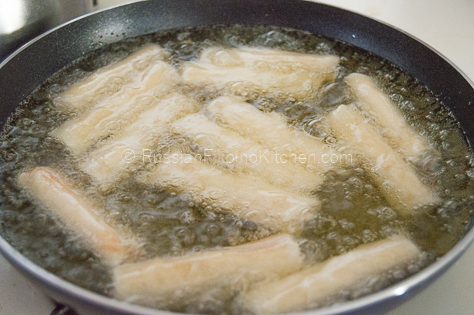 This way, you’ll have enough time to fry them till they turn a little brown while the cheese just start to melt. Alternately, you can also wrap the soft cheese then freeze afterwards prior to frying. However, I personally prefer the first method as it takes only 30 seconds to fry them when the wrapper isn’t frozen. 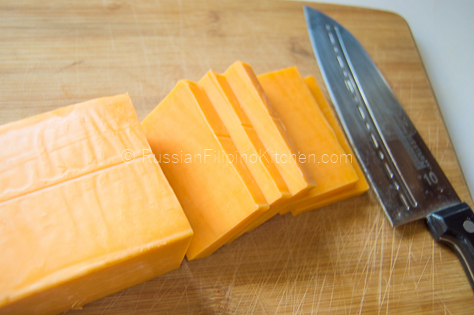 Slice block of cheese across into ¼ inch thickness. (I make 15 rectangular slices out of 1 block. You can slice them according to your desired thickness). 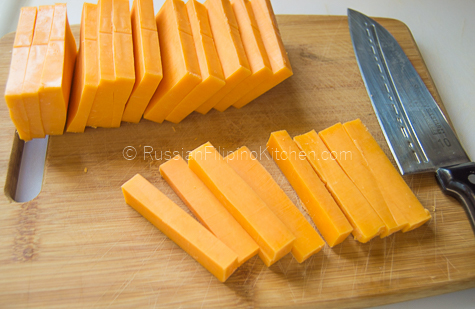 Slice each piece into sticks as shown in the photo below. I make 4 sticks for every rectangular slice. 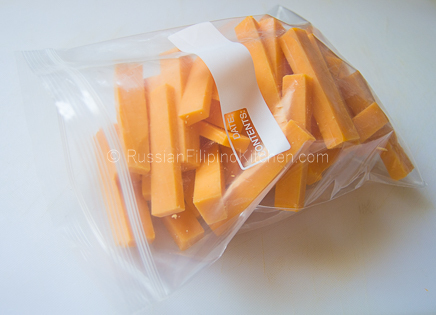 Place in a ziploc bag or container with lid and freeze until cheese are fully frozen, about an hour. 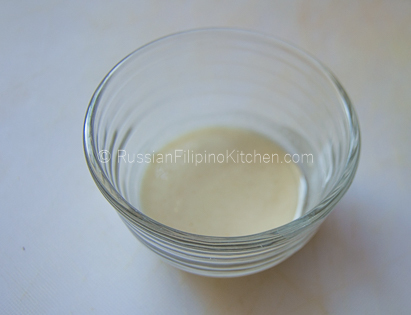 Prepare flour paste to seal lumpia by mixing 2 tablespoons of water with 1 tablespoon all-purpose flour in a small bowl. Set aside until ready to use. 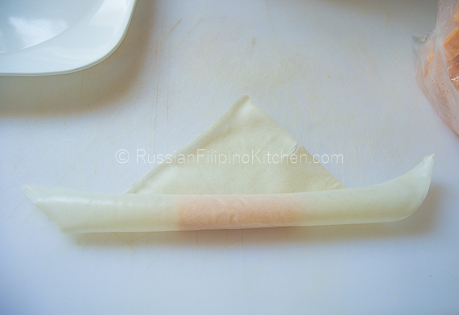 Note: this step is optional if the lumpia wrapper you’re using only requires water for sealing. Read the package directions for proper instructions. With a kitchen scissors, divide individual wrappers into two by cutting diagonally. Cover with a towel or place in a ziploc bag to prevent from drying. 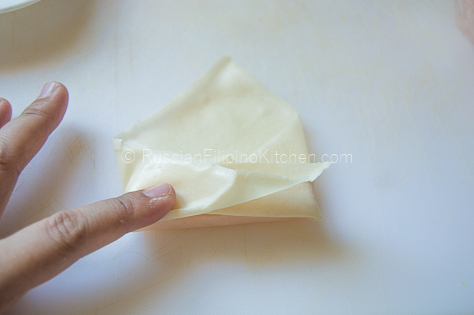 Place wrapper flat on a clean surface with the base of the triangle facing towards you, as shown below. 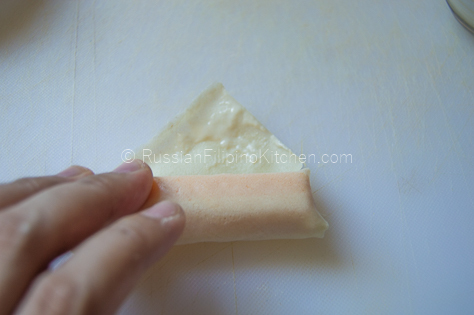 Get one frozen cheese stick and place on the bottom of wrapper, about ½ inch from the edge. 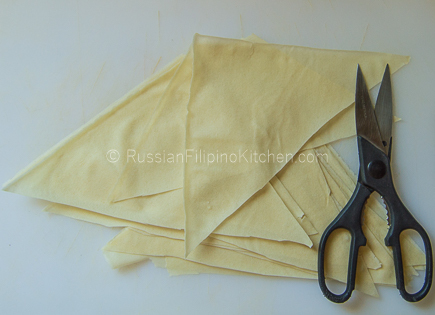 Using both hands, roll lumpia upwards, tightening the roll as you go. Stop when you’re halfway through. Fold both sides in, like an envelope. Continue to roll upwards. When there’s an inch left, moisten the tip of wrapper with the flour paste or water. Roll further to seal. Place finished lumpia roll on a plate. Repeat steps 6.1-6.6 until you wrap all the cheese sticks. If you decide to fry only few pieces, feel free to do so. Return leftover cheese sticks into the freezer for later use. The same thing goes with the lumpia wrappers. Heat oil in a frying pan over medium high heat. Now this is very important. Wait for the oil to get very hot (shimmering but not smoking, about 325ºF to 350ºF temperature) before putting the lumpia rolls in. If you submerge them in oil before the oil gets hot, the cheese will melt sooner. The reason you want to fry them when the oil is ready is that you want to fry them in less than a minute, just enough for the wrapper to brown a little and before the cheese completely melted. Use a tong to carefully drop the rolls into the hot oil. Place enough pieces but do not overcrowd the pan. Deep fry for 30 seconds or until the skin is slightly brown. Remove from the oil immediately as soon as the cheese starts melting. Place on plate lined with paper towels to drain excess oil. Serve warm with sweet chili sauce, sweet sour sauce, or any dipping sauce of choice. Serve warm with sweet chili sauce or any dipping sauce of choice.